Burns the organics and the molecular water out of the clay. Notice the difference in color after bisquing. 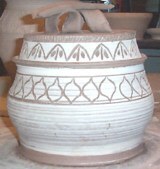 readily absorbs the glazes in high firing. Fires or bisques loads reaching temperatures of 1900 F.
In these images red and white stoneware clay was used.